18° Cloudy with isloated showers. FULL TIMEGeelong remain the only undefeated team in the AFL after defeating Hawthorn by 19 points. BEHIND CATSHawkins wastes no time before sending the ball onto Murdoch who marks in space...he will have the shot after the siren. Murdoch's kick is off line Geelong win by 19 points. The Cats are just need to hang onto the ball but Selwood is not content with that, he twist and turns and then sends the ball long to Hawkins, who once again marks. Time is now the Hawks enemy, with only 90 seconds left they still need three goals to tie it up. GOAL HAWKSHallahan accepts the ball as he runs through the centre he strides to just outside 50 where he lets rip...the ball has the carry, the ball has the accuracy....goal Hawks. BEHIND CATSA running shot from Johnson who is 40 out on the wing, his kick is off line for a behind. GOAL CATSStevie J turns his man inside out and then doubles back to mark 25 out, he then slams home the set shot to put the Cats four in front. Hawks InterchangeBradley Hill off due to an injury. GOAL CATSSelwood grabs the ball 10 out and shrugs off two players before he turns away from goal and sends a long hand pass to Enright, who kicks his second off a step. 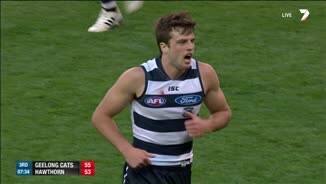 Taylor floats back and denies Gunston who looked to have the sit...good defence from the Cats. GOAL HAWKSA free kick to Rioli for an arm around the neck, is made a certain goal as the ball is not thrown straight back...Cyril strolls into an open goal and sinks it, Cats by 11. GOAL CATSHawkins pulls down another strong mark and kicks his fifth...the Cats are out to a seventeen point lead. Once again it is Geelong who are dictating how the game is being played, Hawthorn have the ball but they have no one to kick it to as the Cats' plug up the space. GOAL CATSHawkins , who is wearing his third jumper of the day, number 34 Walker...just in case you're curious, takes a tumbling mark and then kicks his fourth of the day. GOAL CATSMurdoch kicks a clutch goal as he splits the big sticks from 40 out...we have our eighth lead change as the Cats have a five point lead. BEHIND HAWKSGunston's kick is wide...but the Hawks have a one point lead. Gunston is proving a hand full for Lonergan, he once again drags him towards goal and then leads back out to mark unopposed 45 out. Hawks InterchangeWill Langford off due to an injury. 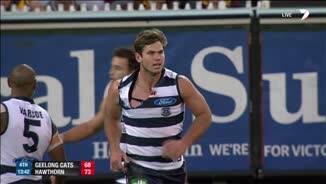 Cats InterchangeTom Hawkins off due to the blood rule. 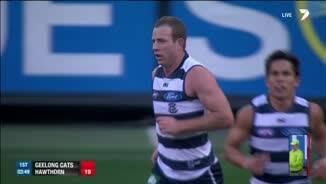 Cats InterchangeMathew Stokes off due to an injury. Hawks InterchangeSam Mitchell off due to the blood rule. Hawks InterchangeBen McEvoy off due to the blood rule. Welcome to MCG for the Geelong Cats v Hawthorn Round 5 clash. 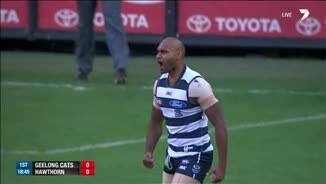 GEELONG'S premiership window remains wide open after a stirring 19-point victory over arch-rival Hawthorn at the MCG on Easter Monday that leaves it as 2014's only undefeated team. 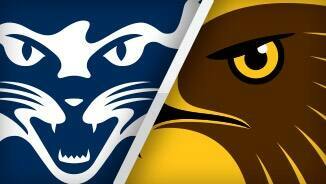 The Cats and Hawks have waged one of modern football's fiercest rivalries over the past six years and, as has so often been the case, Monday's game was an arm wrestle played with a finals-like intensity. The Cats led at every change, but despite having the best of general play in the opening three terms, were never able to extend their lead beyond 13 points in that time. The Hawks then threatened to steal a remarkable comeback win when they kicked the first two goals of the final quarter to turn an eight-point three-quarter time deficit into a five-point lead. But with Tom Hawkins back to his rampaging best up forward, the Cats were able to hit back, regaining the lead through the first of Hawkins' three final-term goals and then running over the top of the Hawks to seal a 15.16 (106) to 12.15 (87) win. 'Tomahawk' was outstanding for the Cats, finishing with five goals and seven contested marks, but Steve Johnson was even better with 34 possessions through the midfield and kicking three goals of his own. The Hawks' comeback win in last year's preliminary final broke a Geelong streak of 11 consecutive wins that dated back to round one, 2009. But the Cats quickly signalled on Monday that the death of the 'Kennett curse' would not mark a new era of Hawthorn dominance. 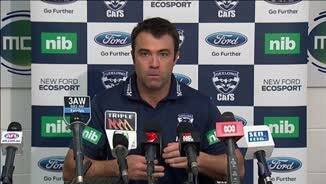 However, Geelong coach Chris Scott downplayed the significance of his team's performance and its 5-0 start to 2014 after Monday's game. "It's the start of a marathon, isn't it? We're round five, and I know you guys need to talk about what it means in the context of the season, but for us, we play the long game at footy clubs," Scott said. "It means a bit but it doesn't mean anywhere near as much as the stuff later in the year. "On our night we're better than the five clubs we've played this year ... I reckon that's all it tells you to be honest." Geelong pressured Hawthorn from the opening bounce, with defensive intensity that ensured the Hawks could not move the ball with their usual clinical precision. But while the Cats had the better of general play, the Hawks were able to hang in there, defending gamely as the Cats struggled at times to convert strings of opportunities in front of goal. Ruckman Hamish McIntosh played his best game for Geelong, his strong marking in attack giving the Cats another valuable option in attack. Key defender Harry Taylor also kept Hawk spearhead Jarryd Roughead goalless, while Jimmy Bartel had 25 telling possessions for the Cats. 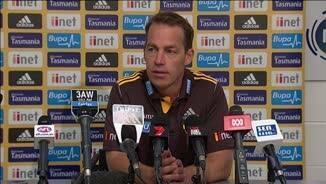 Hawthorn coach Alastair Clarkson felt the scoreboard had flattered his team even though the Hawks remained in the game until the dying minutes. "I thought Geelong were the better side for the better part of the day, so we were doing really well to somehow be in front early in the last quarter," Clarkson said. "But they overwhelmed us in the end and were too good. "Both sides blew some chances. They probably had about 35 or 36 shots at goal – they kicked some out on the full as well as kicking 15.16 – so they perhaps could have hurt us a bit more than they did. "I felt like they controlled the game a fair bit. "We've been going OK for a long period of time, we've won a lot of games of footy and it's not too horrific to get a wake-up call every now and again." For the Hawks, former skipper Sam Mitchell drove their engine room once again, Grant Birchall gave a lot of drive from defence and forwards Luke Breust and Jack Gunston kicked three goals apiece. Young run-with midfielder Will Langford also did a commendable job on Cats skipper Joel Selwood, keeping the early Brownlow Medal fancy to eight possessions in the first half and 20 for the match.